We’ve done our research and hence, we came up with the top 8 picks of the best electric scooter for kids available in the market today. This will help you decide which scooter is most appropriate for your child. Kids absolutely love electric scooters. It’s also a good way to encourage your children to go outside and live a healthy and active lifestyle. This will compel them to exercise, train, and embrace a new hobby. It helps keep them off the couch and break away from computer gadgets. An electric scooter runs on two wheels and is an environmentally friendly way to get around. You just plug it in, charge it and then you are good to go. It’s easy to ride plus it costs less than other motorized vehicles. Scooters are portable and easy to maintain. Just like any other activity, it takes time to get used to. Your child needs to practice in order to get the hang of it. Don’t be afraid to let them fall. It’s all part of the fun and adventure. Your child will learn how to fall, get up, and try again. The Razor E200 is built for kids ages 13 and up and can drive up to 12 miles per hour. 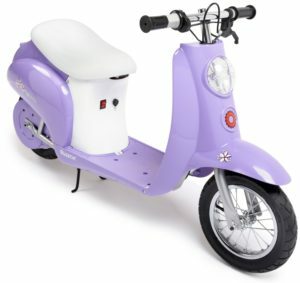 This model is one of the most popular and best electric scooter for kids in the market mainly due to its affordability and great performance at the same time. It is designed with a maximum weight of 154 pounds. The item weighs 40 pounds with 24V rechargeable battery system and 8-inch tires. The E200 is built with a full-size deck and frame with an all steel frame and fork. It is produced with a high torque, chain driven motor, twist grip acceleration control, retractable kickstand, and a hand-operated rear brake. The E200 is lighter compared to other electric scooters which makes it suitable for small kids. It’s easier to move around and it has a better acceleration power. It is considered as one of Razor’s fastest models with a speed of 12 miles per hour. The E200 is produced with an ultra-quiet motor sound and a powerful torque that can climb uphill. The E200 is not built for off-road riding. Has a foldable handle but the newer versions do not. Hence, you still need to unscrew the handlebars. It can only be folded once it’s unscrewed from the deck. The handlebars are not adjustable which may not be suitable for taller children. Compared to other electric scooters, the charging time is slower. You need to initially charge it for 12 hours. The Razor E200 has a solid performance and is designed to for comfort. It’s a good choice for parents who are looking for an affordable electric scooter without sacrificing the quality, functionality and safety of their children. The E300 is designed as the largest and one of the fastest scooters in the Razor collection. It is equipped with full features, high power, and a bigger deck frame and tires. It is appropriate for 13 years old and above and even adults can ride this with ease. It has a larger deck size and frame and can hold up to a maximum weight of 220 pounds. You can continuously use the scooter for 40 minutes. It is equipped with a high torque, chain driven motor, twist grip acceleration control, retractable kickstand, and a hand-operated rear brake. The E300 is one of Razor’s fastest scooters and can speed up to 15 miles per hour. It is developed with a super quiet motor sound with different speed accelerations. Since it is bigger in size, it is designed with extra wide pneumatic 10-inch tires. The E300 is equipped with a power switch so you don’t need to push it to start the engine. All you need is to turn on the switch, twist the throttle, and you’re good to go. Smaller kids may find this model a bit more difficult to control. It doesn’t have any charge indicator so you won’t have any idea how much electricity you have left. The E300 hovers over the thin line between a functional toy and a usable mode of transportation. If Razor added a few more features such as a lock and light function, then it could’ve increased the value of this model. The Razor E300 is a top of the line model and is built to perform which makes it more suitable for experienced riders. It is a good alternative for those who are searching for an economical form of transportation. 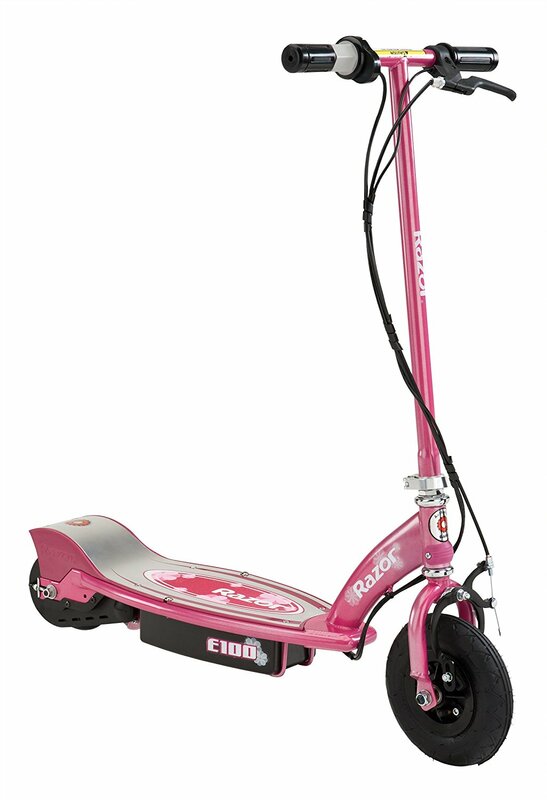 The Razor E100 electric scooter is manufactured with a kiddie-sized frame and deck which is designed for 8-year old children and above. It is specifically developed for the enjoyment of kids. It can hold up a weight up to 120 pounds and can run as fast as 10 miles per hour. The E100 is produced with an all steel frame and fork, 8-inch pneumatic front tire, and a urethane rear wheel. It has a high torque, chain driven motor, twist grip acceleration control, retractable kickstand, and a hand-operated rear brake. You have to kick-start the E100 to begin your ride. The E100 is very easy to use. Just push it off, press the trigger and the electric motor will start running. No frills. It is easy to assemble and the handlebars can be folded for easy storage. It has an efficient battery performance which can even for last more than 40 minutes of continuous use. You can still roll with it even when the battery has run down. The brakes may prove to be a challenge for some especially since it doesn’t instantly stop once triggered. Some attribute it to the strength and power of the rider’s grip. The tires are better suited in dry surfaces. It may slide in case of improper balance. 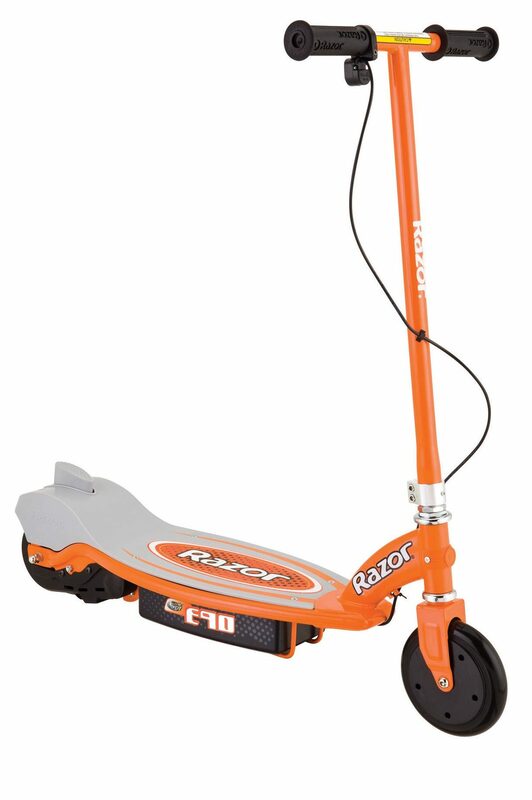 The Razor E100 is a popular choice among parents in terms of form and function. Although there have been discussions on the braking system, most customers and parents view this as a safe ride for their children. It has a super-sized deck and frame and can hold up to a maximum weight of 220 pounds. The seat post is padded for comfort and can easily be removed if the rider prefers to stand up. It is easy to navigate and drive around. The construction is strong and durable. The powerful chain driven motor allows you to ride uphill without any fuss. There have been reports when the motor shuts off even when it is full charged and overheats. If you use it every day, the battery may need to be replaced after just 6 months of use. There are some issues where the throttle sticks while it is in use. The Razor E300S may be popular among consumers but there are a number of concerns and issues raised in terms of safety. It is best to weigh the pros and cons before purchasing this product. However, it is highly noted that most customers gave this product a high praise for its powerful performance. The Razor Pocket Mod is specifically made for little girls who love to ride in style. The pod is designed with a classic, vintage, and Italian-inspired theme. It is suitable for girls who are 13 years old and above and can hold up a maximum weight of 170 pounds. Kids can go as fast as 15 miles per hour and the system has a variable speed acceleration. It is developed with a high torque, chain driven motor, hand-operated rear brake, and a twist grip acceleration control. The shell is made with a step through steel frame and retractable center mount kickstand. It is built with an under seat storage to hold your kid's stuff. The motor can run up to 40 minutes of continuous use and with a battery charging time of 12 hours. It has a suspension mechanism at the back to give riders a smooth drive. The handle is easy to navigate and the motor produces a slightly soft sound which will not disturb other people. The 12-inch pneumatic and durable tires can handle uneven surface including off-road terrains. The tires are a bit difficult to inflate. The 15 mph speed may be fast for some kids especially in hilly areas. The Razor Pocket Mod is a fun ride for little girls. It is best used with safety gear including a helmet and knee pads. 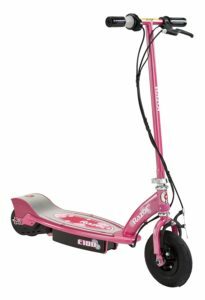 The Pocket Mod is manufactured with durable materials and a suspension system to ensure your little girl goes on a safe, comfortable, and enjoyable ride. 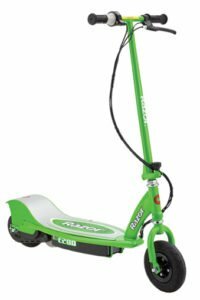 The Razor E90 Electric Scooter is specifically created for kids to enjoy. It is easy to handle and kids can go fast as 9 miles per hour. The speed is just enough for your child to control. 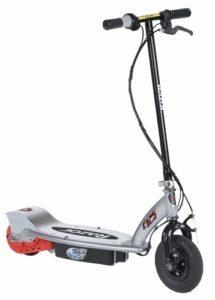 This scooter is suitable for 8-year-old kids and above. It can accommodate a maximum of 120 pounds. You need to kick-start the motor and can use it up to 40 minutes of continuous use. It is built with an all steel frame and fork, kickstand, rear foot brake, push button throttle, and a urethane front and rear wheels. The E90 is lightweight, easy to handle, and assemble. It is built with an optimal grip and flexibility so that kids can navigate it without any hassle. The rear foot brake allows a better balance especially during fast rides and the quick push button throttle provides easy riding. Due to its lightweight structure, it consumes less battery power. In case the battery dies out, you can manually push the scooter. The chain on the right wheel side is slightly interfering whenever you navigate to the right side. The accelerator is limited to a single speed. 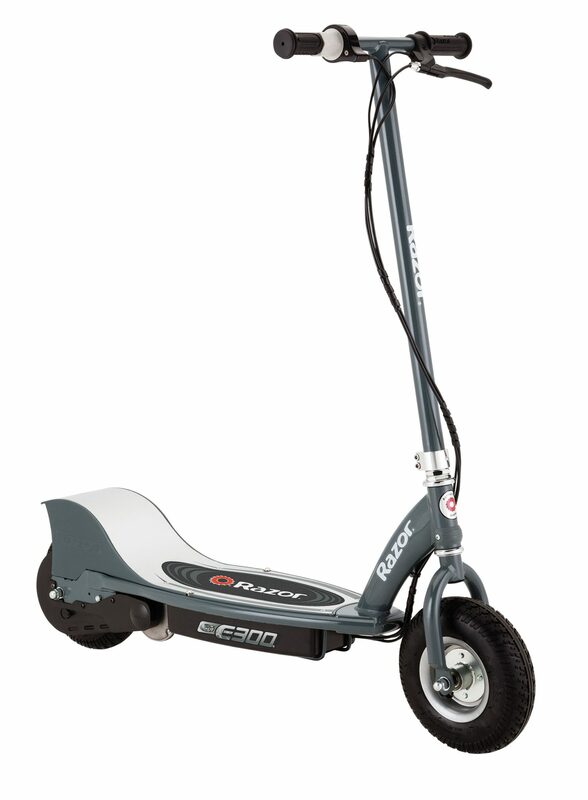 The Razor E90 electric Scooter is easy to assemble and operate. Plus, it’s more affordable compared to other models of electric scooters. This makes this a popular choice among consumers who are looking for a good buy. The Razor E125 Electric Scooter is developed with a kid-sized frame and deck. It is appropriate for kids aged 8 years old and up. This scooter can hold a maximum weight of 120 pounds. It is built with a twist grip acceleration control, high torque, chain driven motor, hand-operated front brake, urethane rear wheel, and an 8-inch pneumatic front tire. The handlebars are adjustable to suit the height and comfortability of the rider. It can speed up to 10 miles per hour and can continuously run for 40 minutes. The handlebars are foldable which makes it easy to store and transport. It requires a manual kick-start. The back wheel is made of plastic. 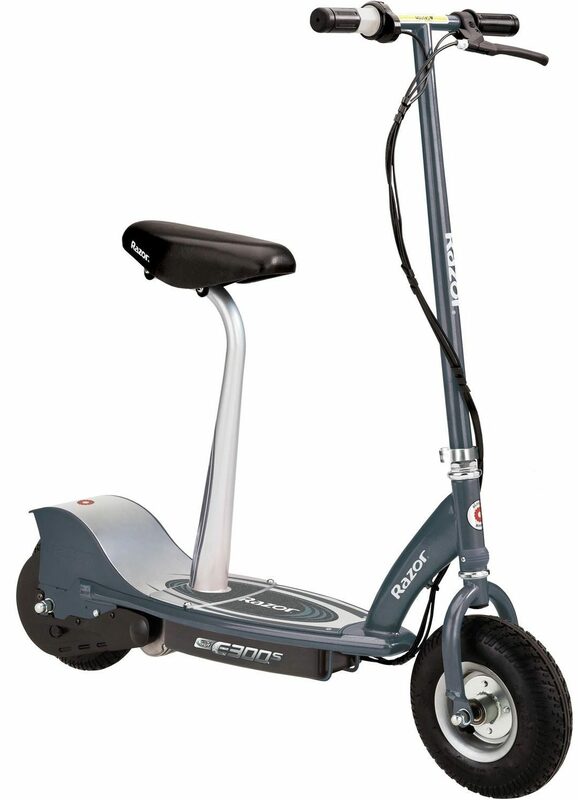 The Razor E125 Electric Scooter is a practical choice for everyday use. It’s a simple scooter with standard features and functions. The E125 is reliable and affordable as well. 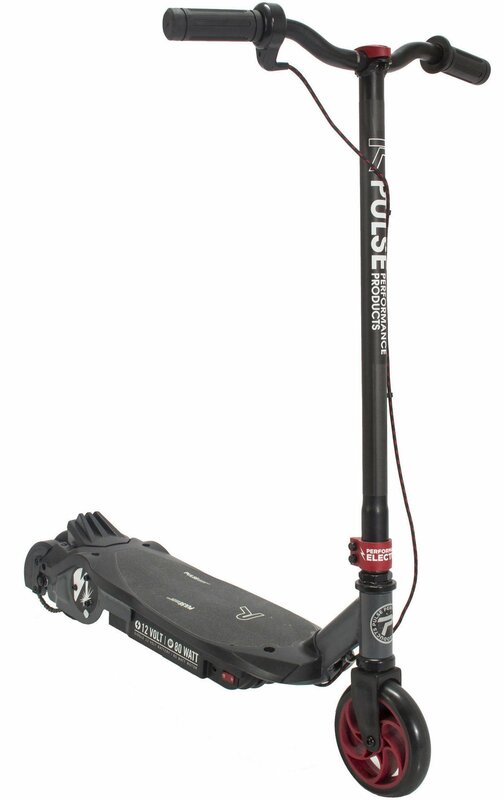 The Pulse Performance GRT-11 Electric Scooter combines power with a lightweight design. It is suitable for beginners and kids who are 8 years old and above. It can accommodate riders up to 120 pounds. The frame, stem, and bars are built using heavy-duty steel which makes this scooter durable and strong. The maximum speed is up to 8 miles per hour for a safe ride and a continuous use can last up to 50 minutes. The thumb throttle is equipped with a Push-to-Go technology and integrated foot brake. This allows the rider to easily transition from a kick-start to electric mode. It is designed with a deck incorporated with an extra sticky grip to provide the rider with an optimum control. This makes it easy for the rider to balance and navigate the scooter. The urethane puncture proof wheels doesn’t require any maintenance. Since it has an 80W battery, you will have to change the battery after 200 full charges. The deck cannot withstand big amounts of water as it may damage the electronic parts of the scooter. It doesn't have a front handle bar brake like most scooters. The Pulse Performance GRT-11 Electric Scooter is particularly designed for the budget-conscious parents who are searching for a scooter that is built to perform with a less expensive price range. Buying an electric scooter is exciting and fun. However, there are certain factors to consider when buying the best electric scooter for kids available in the market. Here are some tips on how to get the best buy. This is the first and most important thing to look for in a scooter. Look for models that are easy to use so you can avoid handling accidents. Go for hand-operated rear brakes, twist grip throttle, pneumatic tires, and a retractable kickstand. Make sure you suit up your kids with a helmet and knee pads. This ensures a safe ride for your children. Consider buying a scooter that has a speed that is suitable for your kid’s age. The older your kid is, the faster he’ll want to go. The fastest speed is 15 miles per hour for non-professional electric scooters. It is appropriate for children aged 11 years old and above. Younger kids are advised to use scooters with a speed of 8 to 10 miles per hour. The best electric scooter for kids is often reflected by its battery life. Nobody wants to buy an electric scooter with a dysfunctional battery. Always check the consumption and charging time. Look for products that have long-lasting battery life. This way, you can avoid circumstances where the battery runs out in the middle of your child’s play time. Before buying, always consider the size of the electric scooter if it will suit the height and weight of your child. Check the dimensions, deck and frame, maximum height and weight. 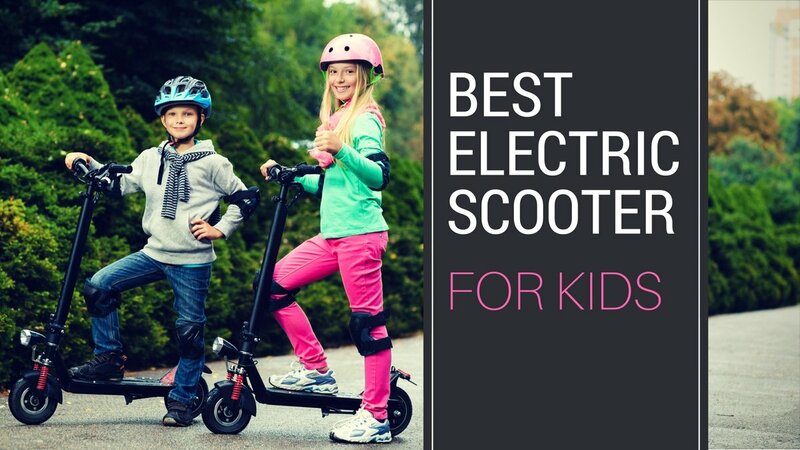 The 8 top picks for the best electric scooters for kids were carefully selected based on the design, safety features, battery life, speed, ease of use, comfortability, and price. Based on the pros and cons, the best electric scooter for kids I would recommend is the Razor E300 Electric Scooter. It is built for maximum performance, can satisfy the need for speed, equipped with full features, and can transition into an economical transportation.